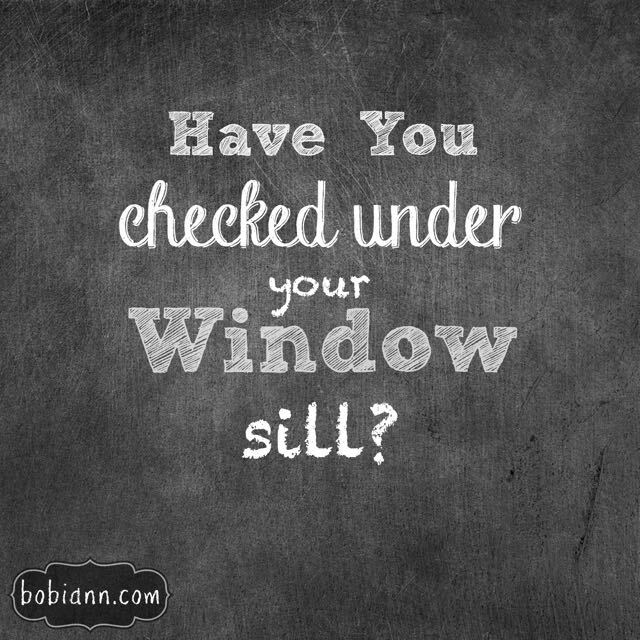 Have You Checked Under Your Window Sills? Allison Younger is one of those precious young women I had the privilege of knowing as a teenager. She was a student in our youth group in Texas and to say I adore Allison would be an understatement. This girl oozes joy. Allison recently got married and as far as I’m concerned, Paul, her new husband, is the luckiest man on the planet. I’m so thrilled for you to get to glimpse into the heart of this dear young woman who continues to make me smile all these years later. My husband and I just bought our first house together. We love it. We love not living in an apartment any longer. We love the space and all the extra room. We have great neighbors and a beautiful neighborhood. We are so grateful for our new place! Moving into the new house was a ton of work. We cleaned, and painted, and cleaned again. We unpacked boxes and organized and decorated. We cleaned some more. Then we cleaned again. And then… We relaxed. We enjoyed our new home. Soon after moving in, there was a storm. So we opened our windows and let the cool air in, and the smell of rain filled the house. It was perfect. Almost perfect. You see, when my husband was opening some windows he noticed that the underneath of the windows was filthy. And the crevices of the window sill were disgusting. Caked with mud and dirt. Now before you judge the cleanliness of our new home, please refer to the beginning of this post where I talked about much I cleaned. I cleaned until I couldn’t clean anymore. It was spotless. Or so I thought. I didn’t know about the underneath of the window or the crevices of the window sill. But not knowing it was dirty didn’t make it any less dirty. That’s when the Holy Spirit flooded my heart with His truth. My overall life can be pretty clean and my heart can be generally pure. I haven’t killed anyone. I love Jesus and His Word. I delight in truth and love. I have wonderful friends who seek godly lives with me. But that doesn’t mean that there aren’t parts of my heart that are dirty. The psalms direct us to let the Spirit search and try our hearts and point out ways that are not pleasing to God. So I did. And He never fails to lovingly correct. I found out that my attitude about doing the dishes isn’t lovely. And I give more of a priority to Facebook and Pinterest than I care to admit. Maybe next week He will convict me about my attitude towards people who are difficult to love, or my frequent Netflix marathons while my studying of God’s Word falls behind. But take heart, because if you know Jesus, there shouldn’t be any fear of letting go of sin. He corrects gently. He loves passionately. And we never leave His presence feeling ashamed. Guilt and shame are of the Enemy. So approach the throne of Jesus with boldness and joy, and know that when He corrects, God is always faithful to point out the way of life and peace and wholeness. And we never leave feeling empty. He fulfills all our needs and desires. And He does it perfectly. So let’s invite the Spirit to search us and try our hearts. Because, like my window sills, being unaware of dirt (or sin), doesn’t make us less dirty. “Search me, O God, and know my heart! Try me and know my thoughts!